My Wine of the Month for March 2016 is Bellingham ‘The Bernard Series’ Bush Vine Pinotage 2013. 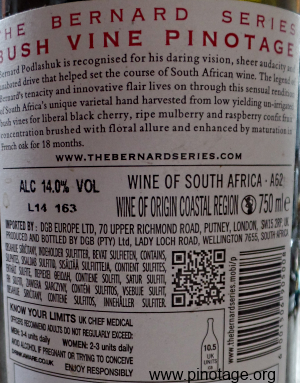 The Bernard Series is named after Bellingham’s original winemaker, Bernard Podlashuk, who was one of the innovating pioneers of South African wine. 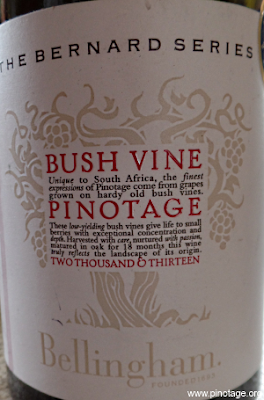 This vintage was a Pinotage Top 10 winner in 2014, but the only time I’d previously tasted this vintage was when I presented it at the American Wine Society National Conference 2014. This is a very modern wine, clean, fresh, harmonious and full of fruits. It’s been aged 18 months in oak that supports without intruding. A most drinkable wine that slips down very easily.